How do I explain a painting rooted in war? How does someone like me write about it in such a way that doesn’t offend the anti-war Americans (a position I respect immensely), or the veterans (a position I also respect immensely), but rather expresses pride for our country and compassion for our fellow human beings? How do I write about this subject in such a way that expresses not a political viewpoint, but a humanitarian one; not an expression of arrogance or superiority, but one of compassion and equality? 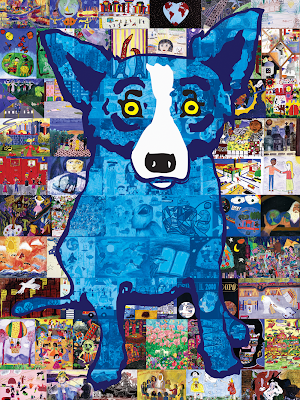 Maybe the questions explain my ignorance, my privileged, peaceful life, my foggy vision, or maybe, just maybe, the answer for someone like me and for George Rodrigue is art. 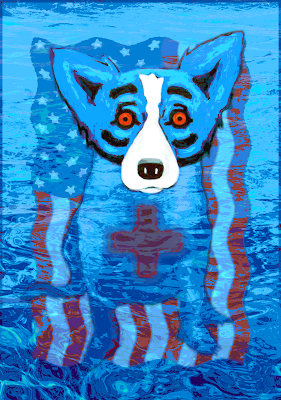 In September 2003, on the second anniversary of 9/11, George Rodrigue teamed up with the International Child Art Foundation (ICAF). 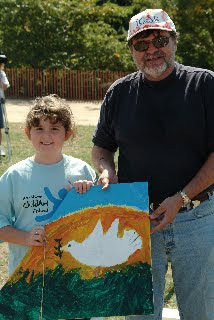 He printed an original silkscreen image, Honesty, which he created from paintings of peace by children from one hundred countries. 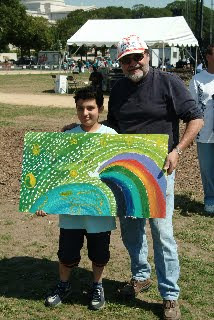 He sold these silkscreen prints and raised $350,000 --- enough money to send the children and their art teachers and a parent to Washington D.C. for a week-long art workshop on the National Mall. 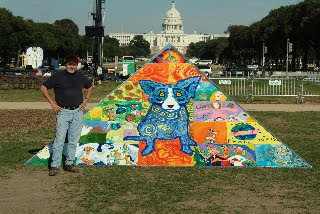 There, George painted with these one hundred children, as well as another fifty (one from each of the United States) to create a pyramid for peace, a project he designed as an artistic symbol, and one that tours America today with that message. Even though we speak different languages, and we worship in different ways, and we adhere to different laws and customs, we still all want peace. In art, we all speak the same language. It was an incredible experience. I saw children from the Ukraine and Saudi Arabia and Guatemala and Iowa painting a conversation and becoming friends. Maybe these children will remember the experience as strongly as I do. Maybe they’ll think twice before ordering attacks on their friends. My parents discovered in 1966 that they were pregnant with me when my mother lived in the Philippines, a place she remained for more than a year so that she’d be close to my father, who was flying and fighting and dutifully following orders in the Vietnam War. My dad, an American patriot who, although he never refers to it other than the quick change of channels when Jane Fonda appears on the TV screen, no doubt felt the late 1960s and early 1970s homegrown anti-Americanism on his own back porch. I can’t imagine this salt in the wound, after he knew first-hand the human-inflicted pain on friends and strangers, after he followed the orders of superior officers he respected, after he fought for the mission directed by his country. 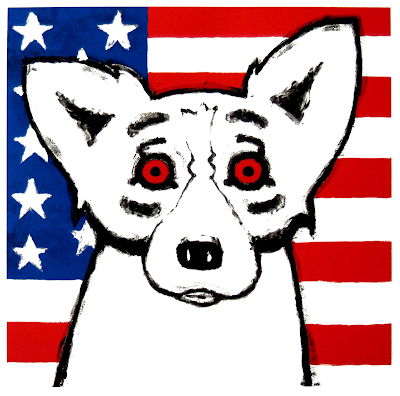 George Rodrigue was summoned for his physical in 1967. He knew afterwards that a draft call was imminent. He got married and lost his father that same year, and so he applied for a deferment. He was an only child, and his mother relied on him to manage the family’s affairs. Fearful of the outcome, he joined the National Guard, only to receive his permanent deferment one week later. Those six years in the National Guard deserve a post or two on their own, so more to come later…. But the fact that he never saw combat (although his experiences with the Selma Civil Rights March and later as a photographer for Spiro Agnew are not to be discounted, trust me…), did not diminish his patriotism. 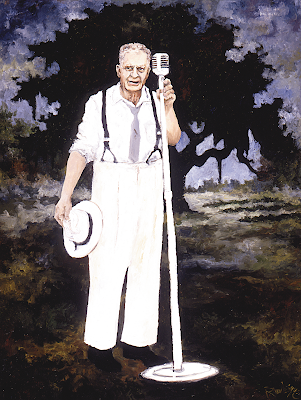 He’s known the honor of painting three American Presidents (Reagan, 1988, Bush, 1989, Clinton, 1997), and his paintings such as Louisiana Hayride (1972), God Bless America (2001, following 9/11), and We Will Rise Again (2005, following Hurricane Katrina), reinforce that commitment to American imagery and pride. And George is right. 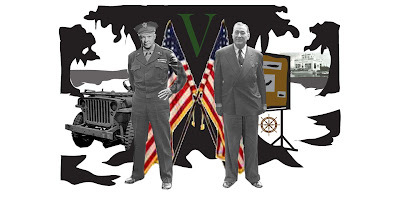 It was Eisenhower who claimed that Higgins, owner and founder of Higgins Industries, “won the war for us,” and it was this understanding that prompted Eisenhower’s biographer Stephen Ambrose to place the museum here. And lucky us. Of all of our many museum memberships, this is the only one I always renew in person. The veterans are there, volunteering to sign us up, wanting to visit and tell their stories. I can’t recommend it highly enough. Higgins built the boats that carried the soldiers to the Normandy beaches on D-Day. Unlike the traditional metal boats, these vessels were made of wood and did not trigger the mines floating along the waves. It was because of these boats that so many of our men landed safely. It was because of these boats that D-Day is the historical victory we know. 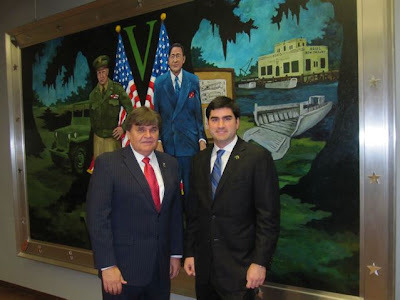 Never before has George Rodrigue been so honored by a commission (actually, a commission he accepted without compensation; rather he gave the painting to his sons, André and Jacques, who then donated it to the museum). He worked on this piece six months. The first three months were not what one would expect. They were on the computer…..
And then there was Higgins: a 1950s New Orleans businessman who looked like my grandfather Felix 'Mac' McClanahan (a WW II veteran) or everyone’s “Cousin” Dudley LeBlanc or any other larger-than-life New Orleans businessman character of the time. After the portraits, George sketched trees and scanned them into his computer, playing in Adobe Illustrator with designs, including a jeep and a shipyard, and a chalkboard with boat plans. 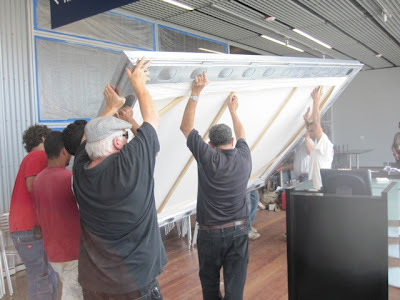 He knew the canvas would have to be big, larger than life-size, and to work out that design by hand would have taken a year or more. He equates his work on the computer with what artists used to call ‘thumbnail sketches.’ By creating the outline before he picks up the brush, he begins the painting with more confidence and avoids a panic about incorrect design or placement. 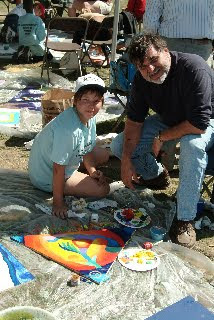 After all of these preparations, I was astonished at the changes once he started painting. First, there was the morning I walked in after George (who painted all night) whited out the Louisiana flag. Difficult to discern at an angle, he worried that no one would recognize the pelican caught in the folds. He 'erased' his work and replaced it with a second American flag. Next, there was the shocking morning I walked in to find one third of the painting missing. He whited out huge sections, moving the oak tree edge on both the left and right of the figures and, even more astounding, the entire jeep! It was gone! He shifted that jeep three times before he was satisfied with its size and placement. And then there’s Eisenhower’s pants. If only I had videotaped how excited and proud George was about those pants! And the last, and I think (for him) the most brutal area was Andrew Higgins’ hands, which he whited out, left for days, and re-painted I don’t know how many times. The last change was adding “WWII” at the bottom of the oak --- something he painted, once again, in the middle of the night, alone and quiet, when he seems to think best. 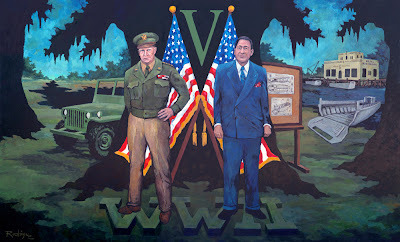 Once he finished the painting this past August, now titled Victory on Bayou St. John, we unveiled it during a party in our home in Carmel Valley, California for forty friends. Believe it or not, it was the first unveiling of his life. 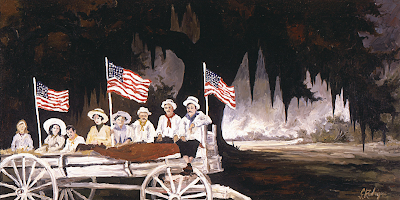 Surrounded by some of his dearest friends, George uncovered the painting to oooh’s and ahhh’s and, most special, to the angelic voice of his friend Myles Williams, a former singer for the New Christy Minstrels, who lead us in patriotic sing-a-longs. It was a meaningful and special afternoon, made all the more so by our new French friends Nadine and Didier visiting from Lyon, France. Didier told us that although he was a young boy at the time, he remembers D-Day, and that if it were not for the Americans, for Eisenhower, for the Higgins boats, and for the jeeps (he really emphasized the jeeps) he would not be here today. And this gracious Frenchman thanked me --- as though I could ever be worthy of this gentleman’s gratitude --- with an embrace and with tears on his cheek. So what is a person to do? On the one hand we want peace ---- I mean, don’t we ALL WANT PEACE? And on the other hand, we meet a Didier who knows his life would be different, who suggests it would be less than what it is, if it were not for our involvement, if not for the lives lost, the injuries sustained, the risks taken. What of the women in Afghanistan? Everyday girls are born into a world that finds them stupid, unworthy of education, undeserving of a walk in the park on a pretty day. Can we stop it? Is it our responsibility? I have no idea, and maybe (obviously) I’m too much of a coward to say what I really think. This museum is a celebration of victory, a celebration of stopping tyranny, a celebration of those men and women who made it happen; it is not a celebration of war. We stopped a madman in Europe sixty-four years ago, and we, along with the allies who helped us, should celebrate that victory everyday. Visit the National WW II Museum and, more important, take your children. I heard (unconfirmed) that a recent survey in New Orleans showed that eighty percent of our twelve-year olds think that our enemy in WW II was Russia. American history, like it or not, involves war. And we owe it to those who fought for us, who fought for our freedom and for the conviction of our ideologies, to honor those memories with education, museums, and proud artistic historical images of American ingenuity and heroism, such as George Rodrigue’s Victory on Bayou St John. "The brave young men rode onto the beaches and into battle on Higgins Boats, built in New Orleans by Andrew Higgins, the man Eisenhower said, 'won the war for us.' Higgins was a patriot and a visionary capitalist, but he could not have built tens of thousands of ships in a few short years without a tremendous effort from his workers. In a scene repeated in cities all across the country, the people of New Orleans came together - black and white, old and young, men and women - to propel the war effort. Like their soldiers, they worked hard and made sacrifices because they all believed in the righteousness of their cause. They believed that, as a popular saying of the times had it, 'we're all in this together'." Thank you, so much for sharing your insights. I don't know if you, yourself are a painter, but you do have a gift in your writing. Thank you for this beautiful writing. I agree with the gentleman above,you are a gifted writer. You paint with your words. I just asked my sons if they know who we fought in WWII and right away they piped right up with Nazis and Germany and Japan. Three boys by the way,7,11and13. Be safe.